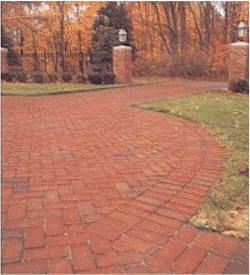 Brick pavers can have a tremendous influence your homes appearance. Brick pavers in the right color and texture combined with the use of colored grout mortar will determine much of your home's overall look. The good news is that selecting the best combination can be not only easy, but enjoyable as well. Brick paver color selection and shape are the most important factors, so start off by choosing a color and style that complements the architectural style of your home. With this in mind take a look at the different styles, textures and colors available. To view them in context, visit the full-scale wall displays located at any flooring supplier in your area and if possible take a few samples of each color home to compare. With brick pavers, it is important to consider the lay of the land on which you are installing them when choosing your color. Overall, a darker color will help your home blend in with the landscape making your landscaped garden look larger, whereas a light color will accentuate and bring the house forward. If you happen to be located on the low side of the street, a light color will help to suspend or 'lift' your house out of the block. Also bear in mind, seemingly small details can greatly influence your home's exterior. For example, contrasting mortar will highlight and frame the bricks, while matching mortars make it appear as a single block of color and less busy. Different mortar treatments will also produce different and sometimes dramatic effects. Raked mortars showcase and somewhat darken the overall look of the area, while mortar that is flush with the face is more noticeable and has a tendency of lightening the area. Now that you have chosen one you love and that fits best with your overall theme, it is time to coordinate the colors for the rest of the house. With a variety of items to consider, it can certainly be a challenge to coordinate the colors of the roof, patio or driveway, windows, gutters and doors. Don't allow one color to dominate, but select colors to work harmoniously with the rest of the house. If you are unsure, get complimentary professional advice from a design consultant. These professionals have experience in bringing your dreams into a reality, by creating color schemes that suit not only your home but you the owner as well. For more information on this and other clay products... FloorBiz is your starting point to all the important flooring sites on the internet.